The end to one of the wildest arcs of 'Vampirella' ever comes to a close in disturbing but entertaining fashion. Was Vicki's last act betrayal or merely a survival tactic? Can Vampi escape certain death and will God finally be found to restore heaven? Jeremy Whitley and Rapha Lobosco answer all. Let me start by pointing out what I didn't like so the rest of the review will be just the positive stuff. The issue opens up from Vicki's point of view. It's her running monologue basically giving her backstory and while doing so recapping what's happened so far. It rehashes the arc thus far leading up to the point where she plunges a sword through Vampi's heart in a forced battle by Pantha to enter heaven. It's a minor quibble, I know, it's just two pages of summarization from her perspective but what can I tell you, I wanted answers for that cliffhanger in the last issue. And she does explain her thought process in that heat of the moment, in the middle of the fight, it was actually a stroke of genius. Whitley basically made me out to be a whiner for complaining about the opening of the issue like this when the twist of her seeming betrayal was really a clever plot development. My hat's off to you, Mr. Whitley. Vicki's calculated risk takes some ominous turns as she enters heaven and it's not as glorious as advertised. Obviously, things have changed since God went missing shaking up the whole souls-entering-heaven promise. Instead, people on earth can't die causing a bottle-neck for souls waiting to enter the afterlife. Part of that malfunction Vicki uses to her advantage to keep Vampi alive long enough for her to find God and restore order. Pantha's part in this scheme using Lucifer's technology is a revelation so whatever negative thing I said you can dismiss and savor the issue completely. The most effective development is Pantha's torture of Vampirella. It's reminiscent of Bond villains who strap agent 007 to something and begin to threaten and beat him. Pantha does so in vampire-appropriate ways and the result will make your skin crawl. Whitley's dialogue is sensational, presenting two adversaries who volley back and forth, one menacing the other defiant. It's really a riveting scene that ends with a depleted and drained Vampi hungering for blood given a moral choice to succumb to her primal instincts or resist at all costs. Doing the art this time is Rapha Lobosco and he carries on the work Andy Belanger has done on this arc. Rapha's lines are a little cleaner and he seems to revel in the more bloody gory parts. Lee Loughridge continues on colors with a subdued palette appearing at times to be filtered through a sepia lens. Nonetheless, this issue retains its signature look that's consistent and fluid. The way it's all laid out and the panels framed gives the story the punch it needs. 'Vampirella' ends Whitley's excellent run with a clever and exciting finish that's just as wild as the issues before it. The combination of moving heaven and earth while giving Vampi a romantic interest with her own agency raised the stakes for this story in some unexpected ways. 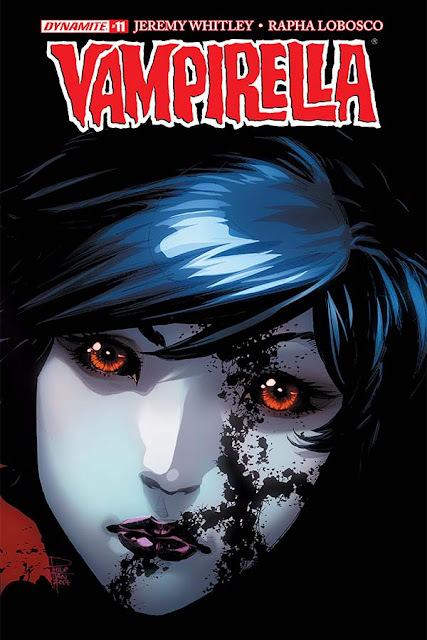 It would be a shame to lose the Vampi-Vicki romance after this arc but Whitley and company should be proud for putting their own spin on such an established character. Whitley's run is going to translate into one hot trade paperback. But don't wait, check it out now.